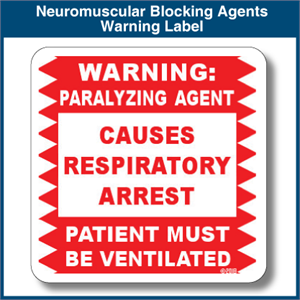 Neuromuscular blocking agents have a well-documented history of causing catastrophic injuries or death when inadvertently administered to adult and pediatric patients who were not receiving proper ventilatory assistance. Because neuromuscular blockers paralyze the muscles necessary for breathing, some patients have died or sustained serious, permanent injuries if the paralysis was not witnessed by a practitioner who could intervene. 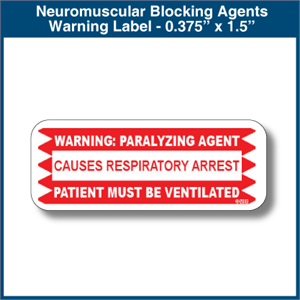 To help pharmacists comply with the recommendations of ISMP and other authorities, Medi-Dose has created a series of Neuromuscular Blocking Agent Warning Labels available in preprinted sheets. 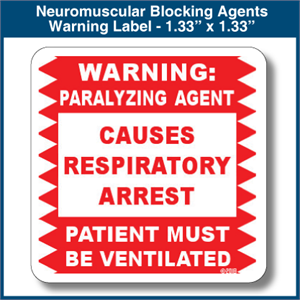 By recommendation, auxiliary labels stating “WARNING: PARALYZING AGENT – CAUSES RESPIRATORY ARREST – PATIENT MUST BE VENTILATED” should be placed on all storage bins and final medication containers (e.g., vials, syringes, IV bags) of neuromuscular blocking agents to clearly communicate that respiratory paralysis will occur and ventilation is required. 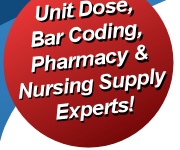 Additionally, the same images are available for customers who use our MILT software so they can easily add the warning to their unit dose packaging and labeling.